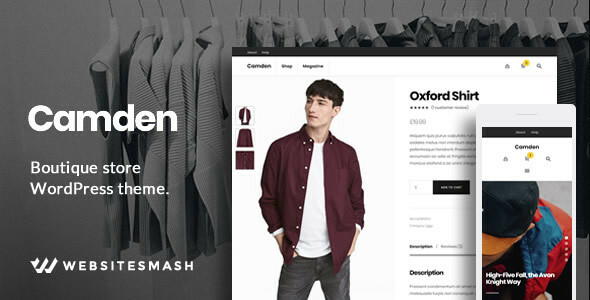 Camden is a premium e-commerce WordPress theme made for boutique online stores selling anything from designer clothing, jewellery or furniture, cutting edge electrical goods, artisan food or digital products, and services. Camden is crafted to be simple to use so you can create your clean, modern online store quickly and easily with WooCommerce, the worlds most popular e-commerce platform. Camden is compatible with the awesome free SiteOrigin Page Builder plugin and WooCommerce, and includes stacks of template and theme options to help you create the perfect website for your business. Camden has been lovingly created by an established Envato Elite author with a proven track record of great themes and customer support. Join over 8,000 others who have built their websites with our themes! Don’t Forget to Rate Camden! If you purchase and love Camden (we’re sure you will) please take a moment to leave a five star rating! We really appreciate the feedback. Camden is the most beautiful way to present your business. It’s clean, modern design gives your business a confident look that stands out from the competition, and it looks great on devices of any size. WooCommerce integration gives you a rock solid platform for you to run your online business with the flexibility to help your business grow. The comprehensive (but not overwhelming) theme options are fully integrated into the native WordPress Customizer allowing you to configure your site quickly and easily with a live preview of the changes as you go. SEO friendly template structure and social media share links integrated into Camden’s modern blog will help you reach and engage with your audience. Fully responsive layout – Looks great on any device from desktop down to mobile. FREE Page Builder plugin – Includes compatibility with the Free Page Builder by SiteOrigin plugin. FREE Post Share plugin – Includes WebsiteSmash Share plugin to add social media share links to posts. Live preview theme options – Easy to use theme options powered by the WordPress Customizer and Kirki. Customizable headers – Set post and product category specific background images. Colour options – Match your site to your brand with light or dark colour schemes and accent colour options. AJAX pagination – Elegant animated AJAX pagination on post and product archives. – Standard text or upload separate header and footer logo images. Toggle page/post elements – Elements can be easily disabled individually via settings in the WP Customizer. Demo content – Includes an xml file containing the theme demo content (excludes images). Social network buttons – Customizable site footer social links. Well documented – 2500+ word documentation file. Child Theme compatible – and includes a bare bones child theme ready to use. Great Support – Reliable, fast support from an Elite ThemeForest author with 8500+ sales.